According to some, social media is the latest hype that will change the world as we know it. These so called – usually self-proclaimed – social media experts spread these words of wisdom for everyone to hear -and for them to profit from. According to research done by blogger B.L. Ochman in her blog post ‘Self-Proclaimed Social Media Gurus on Twitter Multiplying Like Rabbits‘ the number of ‘self-proclaimed social media gurus, experts, superstars and ninjas’ Twitter accounts has tripled in seven months from 4,487 in May 2009 to 15,740 in December 2009. These numbers were found using the website www.tweepsearch.com. Unfortunately, this Twitter-search service is no longer active so checking the figures for today’s number of experts using the same method as Ochman is impossible. 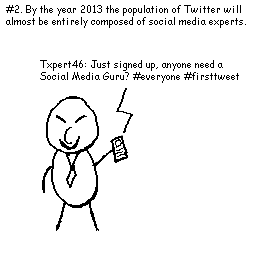 Despite this, Alan Patrick used the results of the research to calculate that every six months there will be about 3,5 times more Twitter guru’s which means that by the year 2013 the population of Twitter will almost be entirely composed of social media experts. Now that’s quite a frightening thought! The model as proposed by Patrick is quite simple, he doesn’t take in consideration a lot of factors because it is almost impossible to guess how Twitter (and the internet) will look like by 2013. I think you can safely assume that the trend of the increasing amount of social media ninjas and superstars will hold on for a while, but it will be much less than anticipated by Alan Patrick’s model. This growing industry needs a standard to be set to ensure trust and reputation. Because without either, it will become harder and harder separate the real experts from the ‘experts’. On top of that, without it the findings by B.L. Ochman are fodder for those who say that social media is simply hot air.